Did you know that the history of military spouse clubs can be traced all the way back to the revolutionary war? In fact, Martha Washington herself has been largely viewed as the driving force behind what we now know as Officers’ Spouse Clubs and Family Service programs. The social gatherings Martha spear-headed gave the war-weary wives a chance to connect with others in the same boat, and helped with the war effort as well. Much like today’s military spouses, they catered their skills toward helping the troops and caring for the ill and injured. But as the make-up of the military evolved, so did the make-up of the military family; namely military spouses. Historically, military spouse clubs were segregated into two groups: Officer’s ‘Wives’ Clubs and Enlisted ‘Wives’ Clubs. Over the last decade, however, the military spouse community evolved towards a more inclusive way of doing business. Wives are no longer the only military spouses. More men are proudly claiming this title, making the military spouse community even more diverse. In an effort to bring a more targeted sense of camaraderie and inclusion into the spouse club realm, another trend has been taking the military community by storm: the All-Hands Military Spouse Club. Gone are the days of segregating based on a spouses’ rank. Spouse clubs have become just as diverse as their participating members. Recently, NMFA had the opportunity to attend a monthly luncheon held by one of the newest all-hands spouse clubs; aptly named Capital Area Military Spouses (CAMS). CAMS is based out of Joint Base Myer-Henderson Hall in Arlington, VA. The National Capital Region, made up of several installations in the Virginia, Maryland, and Washington D.C. area, is dispersed in terms of community. When military families move here, it can be difficult to connect and find one’s ‘tribe.’ Moving is already tough. 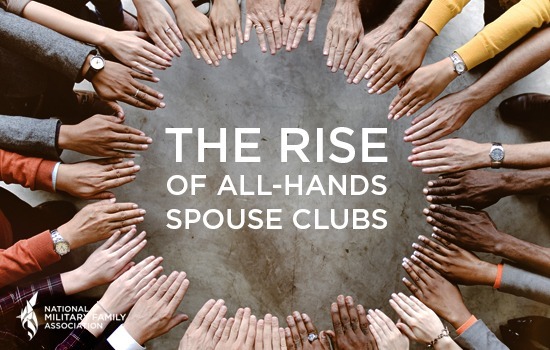 An all-hands spouse club makes it a little easier by removing other barriers, such as branch of service affiliation, rank, and military status. CAMS membership not only includes spouses of enlisted and officer service members, but includes reserve and retiree spouses, as well. This allows for collaboration and a ‘One Team One Fight’ mentality. When people come together to acknowledge their similarities rather than their differences, and each use their unique strengths, more can be accomplished and unwavering support truly thrives. Thanks to all who helped make CAMS a reality! We truly are a ‘purple’ club for all! Looking forward to another exciting year!